It was time for us to go home after the shift. Upon entering the transfer elevator, Mary Rose (not her real name) of them suddenly paused before entering. Upon leaving the building she told me that she saw a lady in the elevator then disappeared after seeing her (Mary Rose) staring back at her. I have known her having the ability to see other people cannot. She has the gift to see beyond the normal plane. Later I asked her to described how the person looked, she said it was as tall as me but she can't distinguish the clothes she was wearing. I asked what the lady look like to check if she was resident of the building we work or just a lost spirit. She concluded that this one is a resident of the building since she was able to disappear immediately after knowing that somebody can see her. It only raised my suspicions that the building is not ghost free. I have decided to see what other places usually these lost souls roam into. 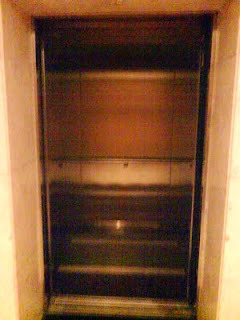 Since this is where my idea started, I decided to have the elevator first from the list. Have you ever wondered why sometimes elevator opens up at a certain floor but nobody waits from the other side. Normally it might be another person pressed the button but have to attend into other matters deciding not to use the elevator. If that is not the case, chances are you have an unseen companion in the elevator. Lucky for you if you don't see or feel them, because what you don't see won't worry you. This is one of the perfect place for ghosts. How can I tell it? The place is usually cold and it has the perfect thing for supernatural doorway, the mirror. Mirrors have been long known to be a portal to the other side. It has been always correlated to paranormal principle and other superstitious belief. 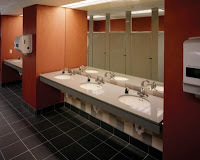 One example of possible haunting within the restroom is the flushing of toilets but nobody gets out of the cubicle afterwards. If it gets stinky, it ain't Moaning Myrtle in your comfort room. 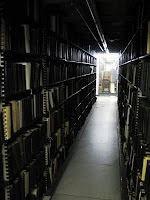 Have you ever tried getting a book on that far section of the library alone? Isn't there an eerie feeling watching you from the other side of the bookshelves. Books falling from the shelves on their own are some signs of hauntings within the area. Library is the best spot for spirits since they want a quiet place to stay. So the next time the librarian asked you to keep quiet better follow them and don't wait for the Others to tell you to do so. If a house goes abandoned for such a long period of time, they tend to earn the monicker of being a haunted house. Why does abandoned house become a favorite place for ghosts? No living activity present, dark, and usually this type of houses are left by the owners due to painful memories they want to leave behind. These memories are what luring spirits to the house. Generally, any place within the hospital is a favorite ground for spirits. It's here that they are either lost, just passing by, or tend to stay. Hospitals are the place for the beginning of life (birth), and end of it (death). This is the place they usually start to exist as a ghosts. They are usually disoriented and still thinks they are alive. That is why they tend to act normally when you see them. Yes, this place is not exempted from the hauntings. Long ago and I believe that as of today, some of the catholic churches have graves at the back of it. Long ago, when a missionary priest dies, they are given proper burial at the back of the church since it would be difficult to transport them to their place of origin. This is the common practices for foreign priest during those time. You can still see some tombstone on some of those churches today. You might be standing when you hear the mass. So are the they really haunting the place? There's a possibility that the hauntings are just memories of the dead priests, especially if they were really attached to the place. Churches also are a hangout for ghosts due to the silent environment. Next time you'll be in these places, please make sure to be mindful even if you are alone. You'll never know if you are really alone.